Vicki Sato figured she could give herself two years with a new biotech startup company before she acquired the “mark of Cain” that would prevent her from returning to academia. Twenty-five years later, just when she retired as a captain of biotechnology, MCB has lured her back, and so has the Business School. “It was a big coup for MCB and Harvard to get Vicki,” affirms one of those who lured her, Greg Verdine, a Harvard College Professor and the Erving Professor of Chemistry. “She was enormously successful when she retired as President of Vertex Pharmaceuticals. The protease inhibitor she developed there electrified the drug discovery community, and it electrified Wall Street. Vicki was one of the few people that led drug discovery efforts from a perceived medical need to scientific knowledge to drugs that went into people for clinical treatment. She was the most accomplished female in the entire biotechnology industry,” and clearly at the very top overall. In the mid 1970s, Sato looked outside her immunology lab in the Cell and Developmental Biology (CDB) Group, which was a precursor to the MCB. She saw only one female scientist with tenure at Harvard, and even after 8 years as an assistant and then associate professor, Sato thought the likelihood of gaining tenure was “pretty low.” Then she saw friends tinkering with genes and proteins in small biotech startups in the run-down warehouses that used to comprise Kendall Square. It looked enticing, but was it appropriate for scientists to dabble in industry? Sato had devoted much passion to the academic path. She did her undergraduate and graduate research in the precursor of the CDB: the Biology Department. In 1972, she earned her Ph.D. in Paul Levine’s lab, using classic genetic tools to study the light reactions of photosynthesis. She pursued those studies during her first post-doctorate at UC Berkeley, but her project required spending too much time in the dark and cold. She switched to warm-blooded organisms and immunology when she joined Leonard Herzenberg and Irv Weisman at Stanford Medical School for a second post-doctoral project on the cellular basis for how the body differentiates self from non-self. In 1976, Sato returned to the CDB Group, until she began noticing the glass ceiling and the excitement in Kendall Square. She took a sabbatical to work at Angenics, a startup that developed diagnostic tools for agricultural and veterinary purposes. Her next move, in 1984, was to join future Nobel Laureates Walter Gilbert, her colleague from the CDB group and now Professor Emeritus in MCB, and MIT’s Philip Sharp at their startup, Biogen, which had just built one of the first new buildings in Kendall Square. Most of the scientists worked on identifying new genes and the proteins they encode, including those with complex function like the interferons. Biogen needed someone to develop cellular assays and animal models for insight into how to use these molecules in a medical setting. That seemed like an exciting opportunity – and a great challenge – for Sato. Sato spent 9 years at Biogen, during which she became Vice President of Research and headed research on inflammation, thrombosis, and HIV . Two drugs that came out of those efforts are Angiomax, an antithrombotic agent derived from the leech, and Avonex for multiple sclerosis, developed from beta-interferon. She was then recruited to Vertex Pharmaceuticals, where she rose to the position of President and which grew from 60 employees to over 1,000. Vertex presented new challenges because it was the first biotech company not based on classic biotechnology – making drugs from proteins – but rather on organic chemistry, like the pharmaceutical companies. “Vertex thought the time was ripe for a small entrepreneurial organization to jump into the scientific arena of big pharma, which had grown inefficient through size and a failure to use the new emerging technologies well,” Sato said. 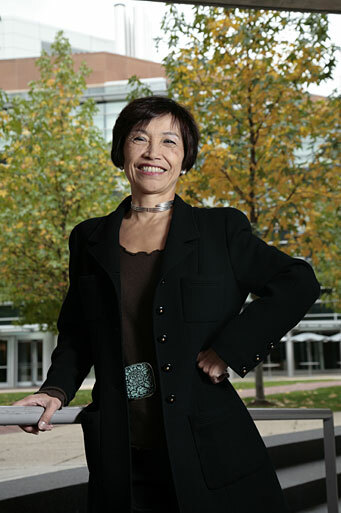 Under her leadership, Vertex developed a diversified drug pipeline, including two HIV protease inhibitors now in clinical use and several drugs in clinical development: the Hepatitis C protease inhibitor (VX 950), two anti-inflammatory drug candidates, a novel molecule for the treatment of cystic fibrosis, and two anti-cancer kinase inhibitors. Just 3 months after she officially retired from Vertex, Verdine coaxed her into participating in the development of an upper-level undergraduate course on drug discovery. “We needed someone with tremendous credibility,” explained Verdine. So Sato returned, as Professor of the Practice of Molecular and Cellular Biology, to “a different but comfortably familiar” academic department – and the same lecture hall where she had taught 25 years earlier. She co-teaches the course, called Principles of Drug Discovery, with Verdine and Fishman. “The course is a microcosm of the union of industry and academia,” Sato said, “and a union of science, biology, and medicine.” The class addresses questions such as: How do you know which product to develop as a drug? How do you go from an observed medical need to screening chemical candidates and then to formulating a safe treatment? How do you take your product through clinical trials and drug studies? Today, being at the intersection of academia and industry is less risk-prone. “When I decided to join that startup, I said to myself that this could be the biggest career mistake I could ever make,” Sato laughed. “But I thought: how often do you get to be in at the start of a new industry? Maybe it won’t be successful, but if it is, it’s going to be a roller coaster ride!” And far from having the mark of Cain, Vicki Sato returns to Harvard with a mark of distinction.